a) Initially the response was outstanding with symptom levels declining from at least 8 or 9 out of 10 to 1 or 2. I could barely feel my eyes. This occurred very rapidly. b) After about 10 days, though, the efficacy of my cure started declining. Symptoms rose to 3 or 4 out of 10. I still would get days or periods with 1 or 2 out of 10, but the problem did not disappear entirely, as I had anticipated. The main thing, though, is that the burning sensation had declined. That's a big win, since the burning sensation is quite unbearable. c) On 20 June, as I write this, some bit of clogging/ irritated sensation has come back to the eye (say, 5 out of 10). And so I'm not 100% cured as I thought I'd have been by now. Tha's a major issue. It might well be that the initial benefits came from the spillover effects of the anti-infammatory eyedrops to which the benefits of my discovered treatment added on, to create a fantastic sense of cure. I have not taken any anti-inflammatory eye drop for one month now, but if the symptoms don't reduce, I might add anti-inflammatory eye drops to the "mix" and see whether that creates a consistent 1 or 2 out of 10. To me that would be good enough as a "cure", although I'd ideally like to see 0 out of 10. Step 1: Do not use these! This picture (of "remedies" I used but which did NOT work) illustrates things that don't work. Don't use hot-rub. Don't use eyedrops: (Pictured) Tears Again, Polyvisc, GenTealm Viscotears, Flarex (this is a prescription only medicine anyway), Refresh liquigel, Zaditen, Maurine Revital Eyes, Tears Naturale, Optive, Visine, Systane (not pictured) or Systane Ultra, Albalon A, Antistine Privine, or Blink. The following is the refined cure (after nearly one month of trial and error) – this is an update of 18 June 2011. 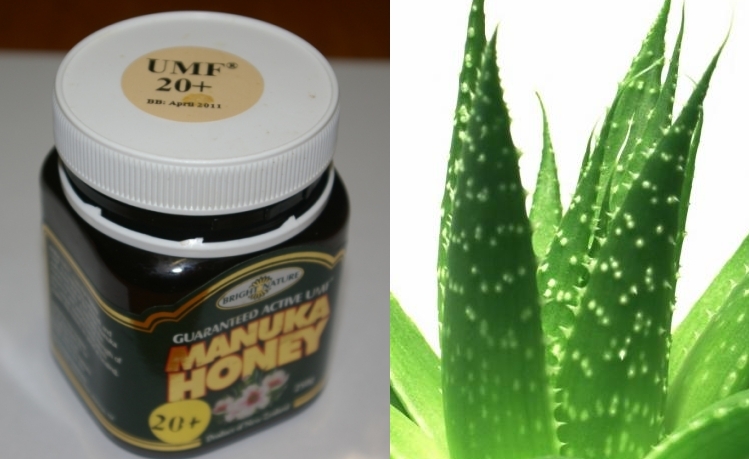 There are five key ingredients to the cure: (a) aloe vera gel directly from the plant, (b) honey (ordinary honey should be fine), (c) triphala water, (d) pure ghee and (e) pure castor oil. I've got two options outlined below. The first one is the REFINED method that I now use, but below that is the previous method that helped in the initial stages of the problem. Pick the one that you think will work for you. A) Make eyedrops and apply as many times as needed. Step 1: Take a pinch of triphala powder (from Indian shop) and mix it in half a cup of hot water. Let it settle and cool down. Step 2: With a big spoon, scoop out about two tablespoons of the top layer into another dish. Throw the rest away. Step 3: Take fresh gel of aloe vera, squeeze it into this Triphala water. Let it settle. Some fragments of aloe vera will become visible. We don't want them. Step 5: Take a little bit of hone (1/8th tea spoon) and mix it thoroughly with this liquid. That's it. These are your eyedrops! They will last one day. Apply these eyedrops/liquid as many times as needed during the day. Note: I'm trying to add a few other ingredients into these eye drops, e.g. rose water. Will update if I find any benefit of these other ingredients. Step 1: Take a tiny pinch of pure ghee (from Indian shop) and rub in your fingers. It will melt. Apply it over the eyelids, and allow a little bit to seep inside the eye. Step 2: Apply one drop each of castor oil into each eye before sleeping. I used this method in the early days of the cure. I have now largely switched to the eye drops method above. I've used Manuka honey but I guess this will work with almost any honey. Wet your finger. Take a TINY dab of honey on the finger. Apply the finger on the eyelashes with eyes slightly open, allowing some of the honey to get into the eyes. This will SLIGHTLY sting for a few minutes. Within minutes you'll start experiencing relief. In the initial days I needed fairly extensive application of Manuka honey inside the eyes, possibly four to five times a day. The eyes would water extensively, thus showing that they were being cleansed. Now, I apply honey just once a day (20th day). Get Dabur Triphala churan from any Indian grocery shop. Very cheap. Take a tiny pinch and mix it in half a cup of hot water. Let it cool down. Use a spoon and take a few drops and put inside each eye. Thank you very much for creating this website. I have been experiencing the SAME exact problem. I have been fighting eyestrain for close to a year now. I have probably done hundreds of hours of research, tried different prescriptions, tried exercises, tried supplements. I also for the first couple of months didn't even know it was eyestrain that I had. This article is great because this confirms what I have been going through. I always have felt the soreness and extreme fatigue right in the upper eyelids. Your explanation here of the muscles and how they tie into this is fantastic. This is probably the most useful and applicable information I have found as of yet. Thank you for writing and please keep writing about the other measures you have taken. I found some very helpful advice in your notes about massage — thank you. But my eyestrain was severe enough that I feared for my livelihood and was nearing a decision to go into retirement early (way too early), because I figured no serious relief could possibly be found FAST enough. In the past year I've had big bouts of exhaustion after heavier than usual workloads. The last time, I had to stop work for a full week. The overall exhaustion felt quite neurological, and I figured it came from eyestrain. Then in one of those flukey things which sometimes qualify as miracles, I quit all caffeine (and I hadn't made any conscious connection between my caffeine intake and the eyestrain; I just quit) and experienced a near-overnight cure. I've been off all caffeine for 3 weeks now and I can work easily again. My eyelids have not been swollen or sore since the 2nd or 3rd day after quitting tea. (I gave up coffee 8 years ago.) And I'm not getting flashes in my eyes anymore, or floaters either. Thus far. The word "eyestrain" is nowhere in the article. The part that made me want to share the link with you is "An allergic reaction to caffeine [can result in] damage to the underside area on the prefrontal cortex, above the eye sockets…" — Text goes on to mention absentmindedness, memory impairment, inability to focus. I had those things going on too, and now everything is improving. I'd be interested to hear about if anybody else experiences a miracle cure for eyestrain after a few days' abstinence from caffeine. In my case there is no relationship with coffee. The symptoms are also clearly different. I am by now 95% sure that the problem in my case is of reduced tears formation, particularly the lipid layer. The fact that I'm experiencing considerable relief with specific eyedrops and sprays /castor oil is making me clearly that I'm on the right track in terms of causality – in my case. Every case can be different so I don't claim to be able to resolving other cases. Hi i have been having problems with my eyes itchyness and dry eyes externally i have been looking highs and lows for pressed or pure castor oil where did you buy yours from please?? From a local chemist shop. Best of luck to you in your efforts to resolve the eyestrain problem, and thanks again for sharing your results. Very helpful. b) My response: Saurav, I'm not sure about this. Sources would be welcome. I have not found any reference to honey as a solution to this problem for the last 8 months nor ANY doctor anywhere in the world (using the internet) who prescribes it in the manner I'm using it. As a result millions of people are undergoing severe pain and burning sensations in the eye and head. There's no point talking "ayurveda" when it is kept as a hidden secret from the world. It is totally irrelevant unless it can help people and make a difference. Also, I have been posting about this problem on my blog for the past 8 months. Why have you not told me about this "solution" earlier? Is it not the job of people to help others with their knowledge? Just want to mention that I had itchy eyelids for years until I quit eating wheat. Also I had taken ketoconazole once as an anti-fungal and the most obvious effect was that my eyelids quit itching. I now have reason to believe I have celiac but candidiasis may also have been a factor. Thanks for the suggestions. I'm over 50 and my mild farsightedness got worse so that I've needed low-magnification reading glasses for about 8 years, plus I have mild astigmatism that I don't believe was ever there before. Will be interesting to see if my vision improves if I try some of these suggestions. The cure I’ve discovered (and it is not a 100% cure – so far, but a 80-90% cure) relates to dry eye symptoms, not to the ones you’ve described. Just so you are aware. The honey tip works great for me – it burns for just a min and then all the strain behind the eye ball goes away. I have gone through your symptoms list, and I feel the strain just behind my eye ball and temple too but cant figure out if its dry eyes or eye rsi as you call it. Will try your other ideas soon. Also you should put up adsense ads on this and your rsicure site as I check they the very highly ranked by google. Just typing "rsi" brings your site on the 1st page for me(maybe cause it knows in my case) but still. I don’t recommend the honey remedy. That was an intermediate remedy. Please. go to the main post in the front of the blog. very confused as to what the remedy is? One website said the one drop of honey, aloe vera, lid care wash, lemon water and your other website sited aruyedic care. Have severe dry eyes affecting vision tried everything else. Indeed, you are right to be confused. I was as confused as anyone else. Just compiling data/ studying/ meeting doctors. I actually found out earlier in 2012 that I don’t have dry eyes but eye strain. Unfortunately, “experts” kept “treating” me for dry eyes and made things worse for a long time. I’ve now outlined the solution to eye strain on the main blog page. Still issues with eyes, but not so bad now.